Ever since Skype appeared on the Apple App Store, it immediately turned the iPhone into possibly the most useful VoIP device on the planet. Millions of Skype users could call each other for free, and the addition of Skype-Out meant they could call real phones at reasonable rates. 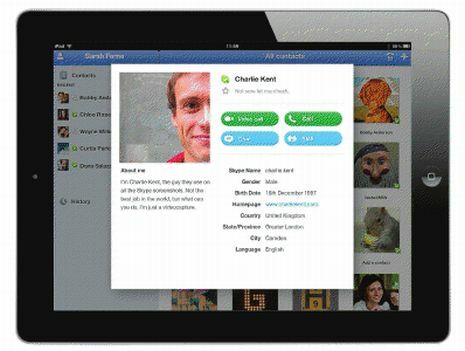 Skype later added video calling, and as soon as Apple brought dual-cameras to the iPad 2, the obvious questions starting to be asked – when will Skype come to the iPad? Turns out, we won’t have to wait much longer after all. This story all kicked off earlier today when RazorianFly spied a YouTube video, posted to the official Skype channel, which showed off the fabled Skype iPad app. Intriguingly the video promptly disappeared. Thankfully though, one quick-thinking reader managed to take a screen recording which RazorianFly then uploaded. Now before we go any further, isn’t that just the most beautiful video conferencing app you’ve ever seen? At this point we were all still a tad dubious as to the video’s authenticity. Why would Skype upload a video and then pull it? Next 9to5Mac got their hands on a screenshot of the original video showing as being uploaded by Skype. Still, that could have been faked. If only someone at Skype would confirm they were working on an iPad client. If only. That confirmation came in the form of an interview given by Skype’s VP of Consumer and Product Design Rick Osterloh to TUAW in which he confirmed Skype is indeed working on an iPad app. Osterloh says that the iPhone version of Skype burst out of the gate quickly, with a big launch and "a userbase that doubled in just a month’s time." And he said the iPad version should "have a similar success," especially since it’s basically the same in functionality: chatting, audio and video calling, and all of the other standard actions you can expect from Skype. The current app has been in testing for a few months now, and Osterloh is excited to unleash it on the public. So there we have it. Skype’s iPad app isn’t yet in the App Store and we haven’t been given an actual release date as yet, but if videos are leaking and Skype are talking, we’re fairly sure the wait won’t be a long one.